The new HTC HD mini will be broadly available to customers across major European and Asian markets beginning in April. BARCELONA, Mobile World Congress – February 16, 2010 – HTC Corporation, a global designer of smartphones, today introduced the HTC HD mini, an HTC Sense-based Windows Phone focused on delivering the popular experience of the HTC HD2 in a more compact design. “The demand for the HTC HD2 has exceeded our expectations, and the HTC HD mini fulfills a desire from some customers to bring the capabilities and experience of the HTC HD2 to a more compact design,” said Peter Chou, chief executive officer, HTC Corporation. The HTC HD mini sports a high degree of usability along with its own unique and beautiful design. Precision fasteners used to assemble the phone are externally visible, displaying a high level of craftsmanship rarely found in mobile phones. And the strong design ethos continues under the battery cover where a bright yellow internal structure, offers an unexpected surprise when the phone is opened. The HTC HD mini utilizes HTC Sense, a user experience focused on putting people at the centre by making the phone work in a more simple and natural way. This experience revolves around three fundamental principles that were developed by observing and listening to how people live and communicate. These core tenets of Make It Mine, Stay Close and Discover the Unexpected continue to be the key to the new HTC Sense experience. 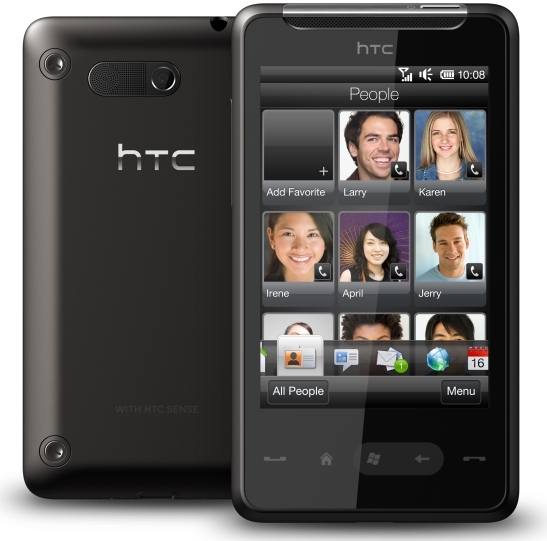 Like the HTC HD2, the HTC HD mini continues the same focus on people-centric communication with complete Outlook integration. It helps you stay close to the important friends and colleagues in your life by providing a single contact view that displays individual communication snapshots of your conversations regardless of whether it was a call, text, status update or email. HTC’s Windows-based Twitter application, HTC Peep, enables you to tweet and follow your twitter stream. HTC HD mini includes capacitive touch for viewing, zooming and resizing websites, Microsoft® Office files, PDF documents and pictures with just a pinch of your fingers. Leveraging its 3G broadband connectivity, the HTC HD mini also offers personal Wi-Fi anywhere for your computer or other devices. The HD mini can also be further enhanced to reflect your needs and style by downloading a variety of applications from the Windows® Marketplace for Mobile.